As I disclose in my bio, I do own some Tesla stock in one of my investment trusts. I own the stock because I believe the company is a promising avenue of speculation, with a lot of risk and a lot of potential reward. I’m not trying to pump the stock price, but you could come to that conclusion based on my stock holdings and my bullish comments on the company. Please don’t consider this investment advice. You can see from the chart above that Tesla has had incredible growth in revenue over the last 10 years, growing from about $15 million in annual revenue in 2008 to over $21 billion in the recently completed 2018 calendar year. This 107% compounded growth rate isn’t uncommon for small startups, but fast growth gets much tougher to maintain as the company gets bigger. So far, Tesla has been able to sustain very high growth rates of 74% over the last 3 years, only slightly slower than 100%. So I thought for this article I would speculate how Tesla could continue to grow at high rates for a few years until it reaches its mission of accelerating the transition to sustainable energy. This mission includes automobiles, trucks, storage and solar. I’m not going to discuss semi trucks, storage, or solar, even though they are exciting areas. At a high level, for Tesla to grow, it needs to build more cars that people want at a price that allows the company to make a profit. There are two parts to building cars people want. Designing the car and building it. Of course, the two parts are related, since the decisions you make in the design (cough, falcon wing doors, cough) could make the building of the car extremely difficult. Elon mentioned at the Model Y unveiling that designing the factory to build the car is 100 times more difficult than building the car. The Model Y announcement helped me realize that Tesla’s strategy has now shifted. Instead of trying to prove to the world that it can make the best car in the world, profitably, which was more or less its goal for the Model S, the Model X, and the Model 3, the goal of the Model Y is more modest. Their goal is to show how they can address the largest portion of the world’s vehicle market (the small and midsized crossover and SUV segments) with a few tweaks to the revolutionary Model 3 design. This hopefully means that Tesla can reuse most of the hard work of building a Model 3 factory to build the Model Y line. It is also possible and even likely that the Model 3 and Model Y could be built on the same manufacturing line. If Tesla can use existing batteries, motors, electronics and interiors to build its next two vehicles, the pickup and the $25,000 Model 2, Tesla may avoid the production hell that it endured for the ramp of the Model S, X, and 3. There will be a large market for $15,000 electric cars, but depending on how the speed of the transition to EVs goes, we may not have to build many. If Teslas can last a million miles, there will be plenty of cars with 500,000 miles available to meet the demand for lower priced cars. Some will prefer a lower quality new car for $15,000, and I’m sure hundreds of Chinese and other emerging market manufacturers will be able to satisfy that need. Another problem Tesla (or the aftermarket industry) must solve is they will be building so many of a few models that the parking lot of the local mall will have 100 copies of the same car. This isn’t a serious problem in finding your car, since your app will guide you to your car, but people won’t want to drive a car that is so common. I won’t address how this will be solved other than to say it is a good problem to have. This is a problem the traditional manufacturers are very good at solving. They make many cars look different that aren’t really substantially different. So Tesla has stated that designing a desirable car is easy but building it is hard, but it has come up with a plan to avoid designing new factories by just reusing what the company learned in building the Model 3 production lines. You still need to pay for the new factories, though, and how do you do that? Tesla has been able to generate about $4 billion a year in cash flows from its existing operations (taking the last two quarters of the year and doubling them, I’ll explain below — Tesla Cycle — why they will be experiencing less seasonal variation in their sales than other companies). Learning from previous factory builds, Tesla thinks it can reduce the cost of building future gigafactories from about $4 billion a year to about $2 billion a year (I think that note is from the 4Q call, but it might be from the groundbreaking of the factory or another article). This means they can split their cash flow to finance about one gigafactory a year and spend the other $2 billion to enhance existing factories and design new vehicles and manufacturing systems. It doesn’t allow them to pay down debt, but companies growing this quickly are thrilled to not to have to go to the capital markets to finance the growth. So, what vehicles and volumes do I see Tesla building? Sales estimates from my interpretation of Elon Musk’s comments on the recent ARK podcast. 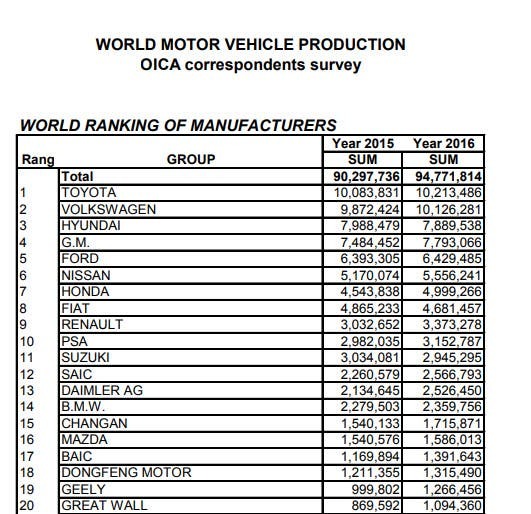 As you can see from the tables above and below, Tesla plans to become a leading manufacturer of vehicles in the world, with only 4 high-volume models. Related: Which Electric Vehicles Could Score 500,000+ Sales A Year? Depending on how much the sales of other manufactures drop when customers around the world realize electric cars are superior and are then unwilling to buy another gas or diesel car, Tesla could be the world’s largest manufacturer by about 2025. When this tipping point happens, even if the other manufacturers have designed good cars that meet their customers’ needs, they won’t be able to secure enough batteries to quickly shift production to EVs when the customers’ tastes shift. How Does Tesla Match Supply To Demand? One of Tesla’s competitive advantages is the relative ease at which it can sell its vehicles into different markets. Most cars need to be substantially reworked to meet local safety and emissions standards. Tesla vehicles have no emissions and are designed to be far safer than any regional standard, so they just need to update their charge port since that varies by market. 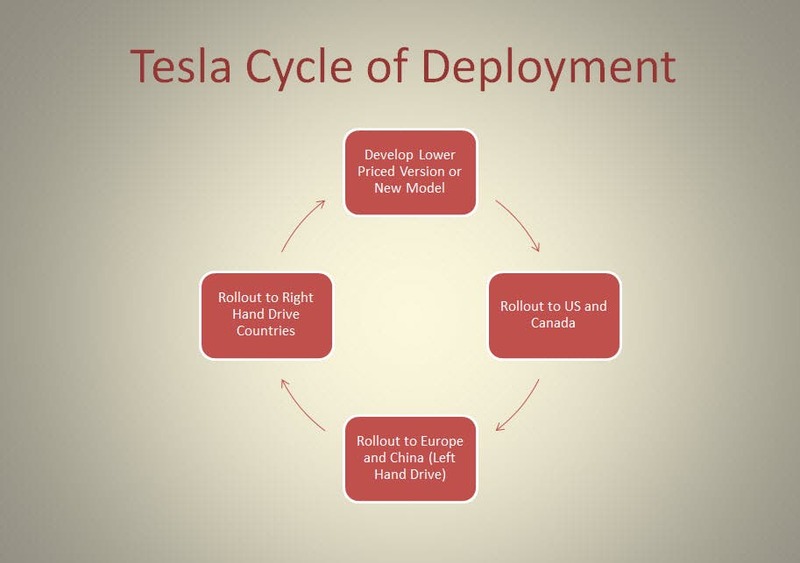 So, how does Tesla use its international designs to match supply to demand? Tesla announces a unique vehicle that has value far beyond anything available today anywhere in the world. This generates a long waiting list for the product and causes people to keep their existing vehicles a little longer than normal, waiting for the Tesla. Tesla ships the new vehicle or model to the US and Canada as it ramps production and lowers its manufacturing costs. Tesla ships the new vehicle or model to the left-hand-drive markets in Europe and China during the pause in demand that occurs in the US after it worked through its waiting list. Tesla ships the new vehicle or model to the right-hand-drive markets during the pause in demand that occurs in Europe and China after it satisfied the pent up demand. Then it starts again at the top with a new model (the $35,000 Model 3 at the moment) or a new vehicle (the Model Y, Pickup, or Model 2). When demand softens in one market, they just start shipping to the next market. The shorts scream “Demand Problem,” but Tesla continues to increase production and sales to existing markets and expand to new markets. They just need a new vehicle design every year or so to start the cycle. Considering how slowly the competition is moving, that isn’t difficult. Battery supply and cost. Tesla as the biggest maker of battery modules (not cells) in the world has significant economies of scale and has established a reliable supply chain. Efficient EV designs that minimize the size of battery needed for acceptable range. As we are seeing, many companies can make a great EV, but making one as efficient as a Tesla is very challenging. I’ve only been impressed with the Hyundia/Kia products from an efficiency standpoint (other than Tesla). Supercharger deployment, charging speed, and reliability. Elon may not call it a moat, but everyone else thinks it is. If Tesla opens this up to other manufacturers, it just provides more financing to expand the already vast charging network. Full Self Driving. Every Tesla car built since October 2016 is equipped to be fully autonomous. Other companies will have great self-driving features in selected models and offered in new cars, but only Tesla defined a standard sensor array and decided to outfit every car with it years ago. Safety. Tesla is obsessed with safety far beyond the requirements of any government organization. It is no coincidence that the top 3 cars ever tested by the NSTSA are all Tesla vehicles. I make it sound easy, but there is nothing easy about growing production by 10 fold over the next 6 years. Yes, Tesla has done it before 3 times, but this time, it will be more difficult because the competition is no longer sleeping. Some of the companies have had their “Kodak Moment” where they realize they may or may not be able to shift to the new technology fast enough to survive. Other companies are “zombies” or the walking dead. They don’t yet realize that they have organizations that can’t build vehicles that customers want and don’t have enough time or resources to make the transition. When they realize it, they will likely lay off half their employees and sell the remaining scraps to the companies that have successful designs that customers want. But some major automakers are also jumping into the EV transition and aim to benefit from it. P.S. I’ve heard Tesla is selling off all its demo cars for the end of the quarter. Sometimes they give big discounts on models with a few miles. Hurry if you want one of those deals. If you want to take advantage of my Tesla referral link to get 1,000 miles of free Supercharging on a Tesla on a Model S, Model X, or Model 3, here’s the code: https://ts.la/paul92237 (but as I have said before, if another owner helped you more, please use their link instead of mine).